The OM-CP-EGGTEMP and OM-CP-EGGTEMP-RH are specifically designed to measure and record the temperature and humidity of eggs during shipping, storage and incubation. The logger thermally responds to an environment the same way a real egg does, simulating the temperature experience of the actual product. 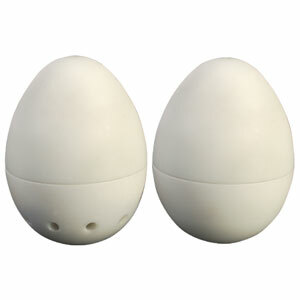 The OM-CP-EGGTEMP temperature data logger is submersible and can measure temperatures from 0 to 60ºC (32 to 140ºF). The OM-CP-EGGTEMP-RH temperature and humidity data logger (not submersible) measures humidity over 0 to 95% RH range and temperature from 0 to 60ºC (32 to 140ºF). These data loggers have a user replaceable battery, that typically lasts up to 1 year. The nonvolatile memory can hold up to 32,767 readings and will retain data even if the battery becomes discharged. Data retrieval is simple. Simply plug it into an available USB port and our user-friendly software does the rest. The software converts a PC into a real-time strip chart recorder. Data can be viewed in Celsius or Fahrenheit, and in graph, summary or data formats. For further analysis data can also be exported to Excel. The storage medium is non-volatile solid state memory, providing maximum data security even if the battery becomes discharged. Alarm: Programmable temperature alarm with high and low limits; Alarm is activated when temperature reaches or exceeds set limits. Activity Indicator: Green LED blinks to indicate device has been started, red LED blinks if an alarm condition exists. Nota: Comes complete with two 1.55 V silver oxide batteries. Operator’s manual and USB interface cable are included with the OM-CP-IFC202 software/cable package (required for data logger operation, sold separately).